As the Hoyas walked off the court tonight at the end of a hard fought victory over the Xavier Musketeers, they realized that this was first time in 7 games against their Big East opponent that they could actually say they grabbed a victory. For the Hoyas, the 80-73 victory means they now are back in the thick of things in the Big East Conference with a 4-4 record and Xavier finds themselves in the middle of a four game losing skid that will have to see the play well the remainder of the season to get into the Big East Tournament with a decent seed.It’s the fourth straight loss for the Musketeers. “I was really disappointed,” said Xavier head coach Travis Steele. “I told our guys going into the game we couldn’t have the mentality to try to outscore Georgetown. We had to have that defensive nastiness and toughness which I didn’t think we had at all in the second half. The keys points from tonight’s game for the Hoyas were that they continued to show a solid team effort. Ewing was able to go to his bench late in the game get results from Trey Mourning and Jagan Mosley. 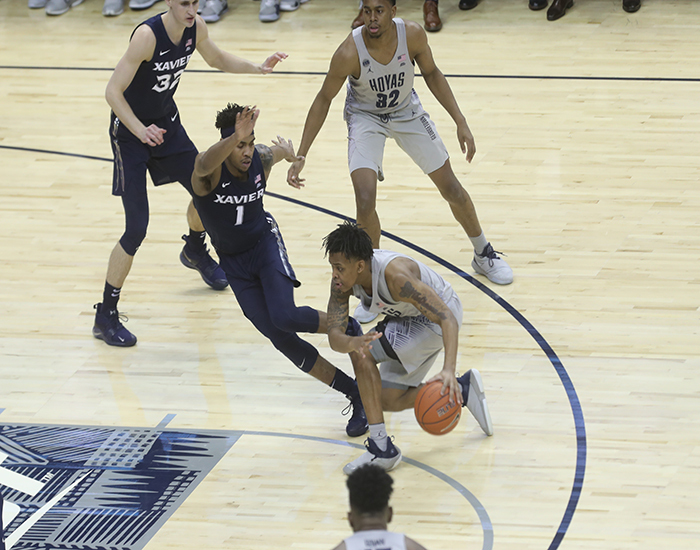 It was mostly another amazing game from freshman James Akinjo, who led all scorers with 23 points, all of which came in the second half that sealed the deal for the Hoyas. ” We let them control our tempo of play in the first half,” said Hoyas Head Coach Patrick Ewing. They wanted to shoot from long range and we knew we would have to answer those shoes and James and Mac answered back when we needed them to late in the game.